This was a poster promoting an exhibit for the MD Department of Housing (etc.) at one of the State conferences. A large double booth was created to look like a spaceship: a TV acted as console of the ship so visitors could view a video of Department projects (think Star Trek viwer) and 'journey' to the new digital future of State government. Massive interior panels to resemble the controls, console, and viewing windows of the spaceship, complete with constellations and galaxies like the "Neighborhood Revitalization Pulsar." 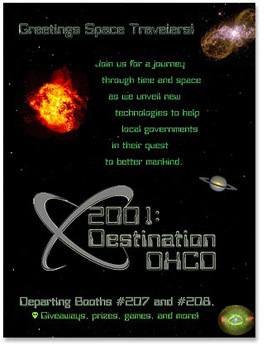 I also created the informational leaflets and alien-themed giveaways.